We work with Blanchard’s Coffee Roasting Co. in Richmond, Virginia, to select the highest quality coffee available from all of the major growing regions around the world. The coffee we use are direct-trade, single-origins & blends. For our cold brew, we work with Blanchard's to rotate our coffees based on their seasonality and availability from the farms. We use a steeping method to brew our cold brew because we believe it gives us even extraction and allows for the natural flavor and sweetness of the coffee to shine through any bitterness or acidity. We offer a full coffee, espresso and tea program at our shop with coffee and espresso from Blanchard's Coffee Roasting Co. and tea from Hugo Tea. Interested in joining our team? Tell us about yourself and why you think you'd be a good fit! Co-Founders Ben Young & Adam Shurr at Golf Park Coffee's shop on Bedford Avenue in Lynchburg. 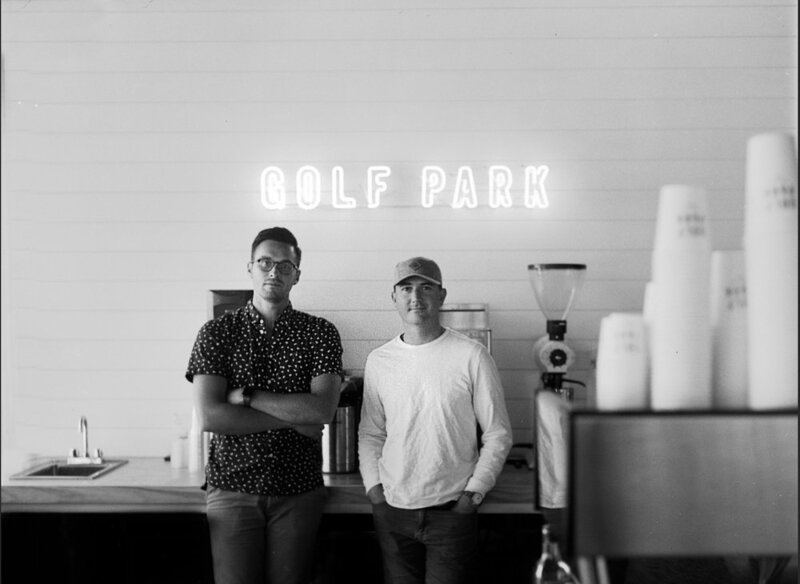 Golf Park Coffee was founded in 2014 by Co-Founders Adam Shurr & Ben Young. We started Golf Park Coffee out of a desire to grow the coffee culture in our area and bring a new exciting product to the market. We believe that community and collaboration are the backbone of our company. Ben grew up in the northern Philadelphia suburbs, before moving to Lynchburg to study Business Administration & Marketing at Liberty University in 2004. Ben has more home coffee brewing tools than any one person could ever need. If he is not enjoying a good meal or drink with friends, you will probably find him outdoors, hiking or camping, or playing/watching sports. Ben moved to Nashville, TN in late 2014 and is responsible for Executive duties including, Business Relations, Marketing, Product Development, and Finances. In July of 2018, Golf Park Coffee opened their first brick and mortar shop in Lynchburg, inside of the Bedford Exchange at 2306 Bedford Ave. This shop is Golf Park's first move into a full espresso and coffee program featuring coffee from Blanchard's Coffee Roasting Co. and tea from Hugo Tea Company. Interested in working with us or have a question?